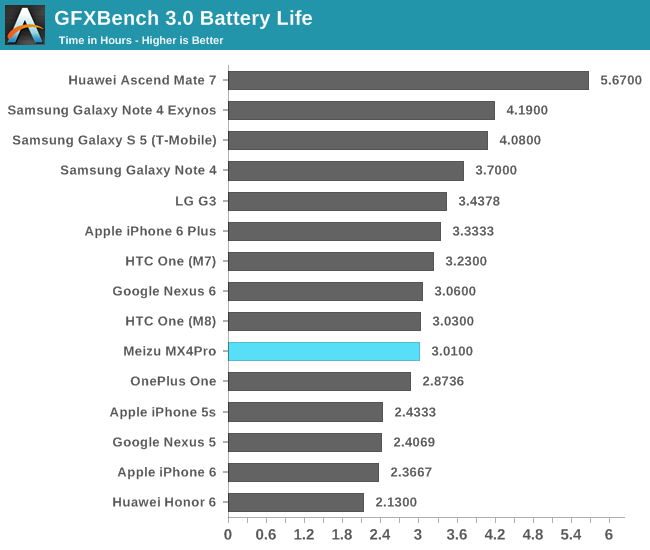 The MX4 Pro employs a 3350mAh 3.8V (12.73 Wh) embedded battery that should perform quite well in combination with the 5.46" screen and Exynos 5430 SoC. To start, let's look at the WiFi web browsing test. 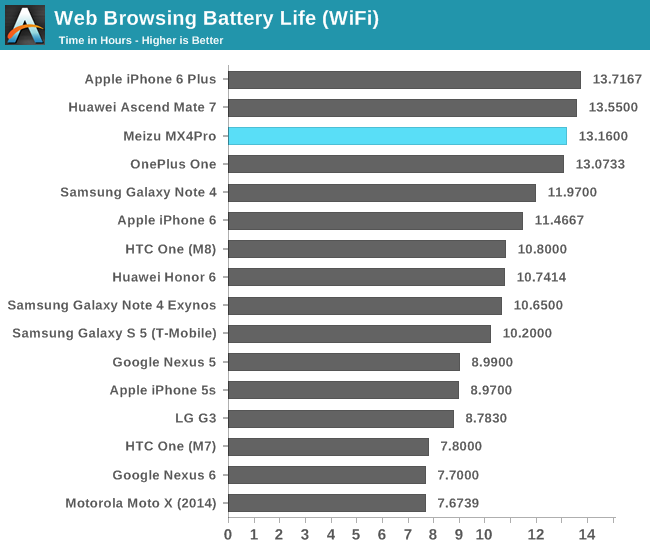 The Meizu manages to achieve a respectable 13.16h, surpassing all our other devices except for the iPhone 6 Plus and the Huawei Ascend Mate 7 with its much larger 4100mAh battery. I again reserve myself from publishing LTE battery tests due to having very different network conditions compared to Josh and Brandon. I only have access to a more power hungry 1800MHz LTE band that would lead to misleading usage figures in our benchmarks. Like the Mate 7, I can only comment on every-day subjective usage. Here the MX4 Pro performs quite well and the Marvell modem seems to be on par with the Ericsson M7450 in my Note 4. I hope to be able to do a more comprehensive test in the future as my device portfolio grows. 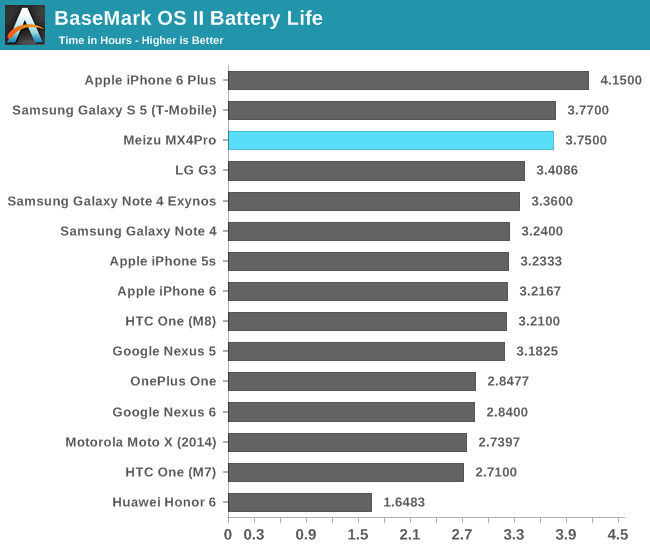 The BaseMark OS II battery benchmark is a CPU-rundown test that measures both battery life and work done. 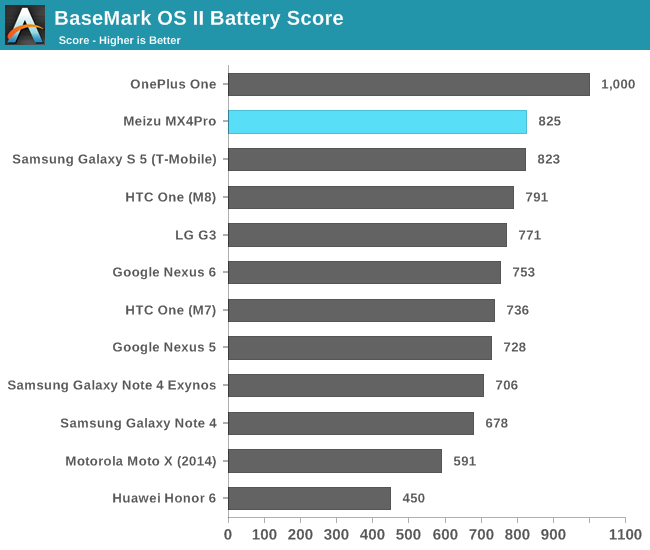 The MX4 Pro achieves both a good battery life and battery score due to the low CPU power consumption of the Exynos 5430. The device became only lukewarm at the hottest during the duration of the benchmark. I started to make device power measurements for PCMark in our Note 4 Exynos review, where we saw how Samsung employed a power savings mode that controlled SoC power by disabling boosting features in the device frequency governors and kernel scheduler together with limiting the frequency of the large cores and the GPU. Meizu offers a completely different mechanism for its three different performance and power states. The normal performance state is the system running all eight cores at their designed frequency targets, so nothing is unusual there. The "Balance" and "Power Saving" states differ from what Samsung employs in its own devices in that instead of modifying the scaling logic of the SoC, they simply disable CPU cores entirely via hot-plugging. The "Balance" mode disabled three A15 cores effectively turning the system into a 5-core system with only one big CPU and four little ones. The "Power Saving" mode entirely shuts off the big cluster and runs the SoC as if it were a quad-core A7 system. To see how this affects performance and power, we turn to the PCMark power measurements. The most noticeable power difference is found in the web-browsing test of PCMark, as here the device can save up a good chunk of power between the three different runtime modes. The video test sees little difference in power consumption, and the writing test sees a similar scaling as the web-test but with less of a delta between the operating modes. The photo test oddly consumed more power in the little-core-only limited power savings mode than when running one A15 core, meaning racing to idle may consume less power in that specific test. 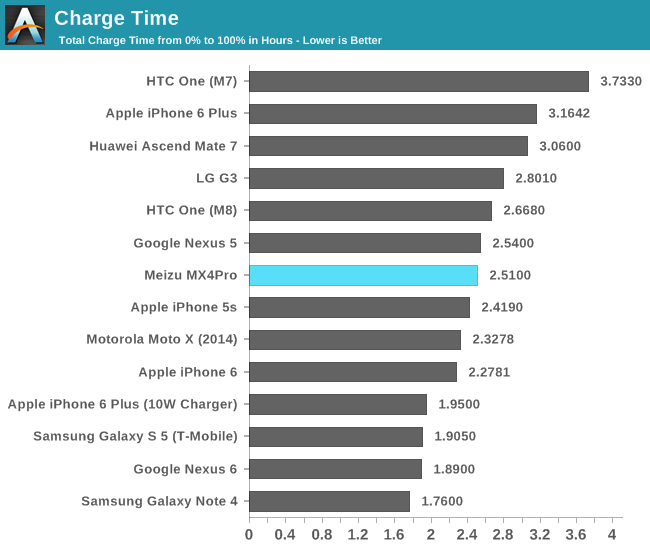 When looking at the performance/W scores, it's clear that the power saving mode performs the worst overall. Due to tasks taking much longer to complete, the total power benefit for a single task may not be beneficiary. In fact I saw this in the writing test in particular as the total energy consumed to finish the test was the greatest in the power saving mode due to the vastly increased runtime. The balance mode with just one A15 core comes out on top in terms of efficiency due to the power gains being greater than the performance lost from having the three other big cores shut off. In overall device usage I found the balance mode to be the best compromise when looking for running the device efficiently, and I don't recommend using the power saving mode at all for general use. 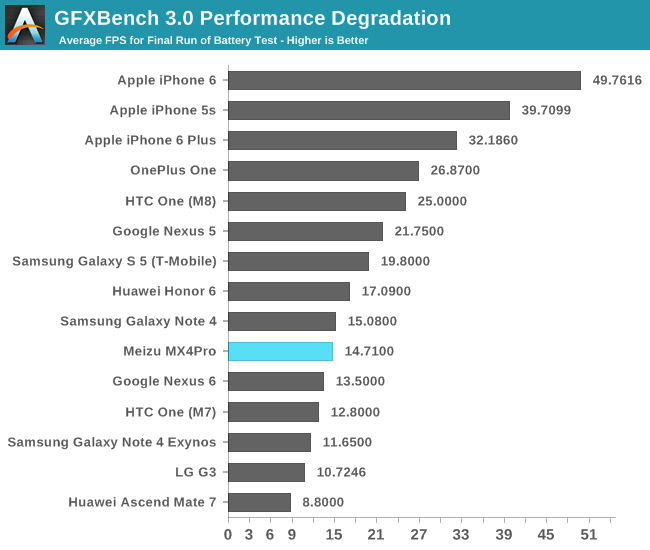 Although the Exynos 5430's Mali T628 in the MX4 Pro was less power hungry than the T760 in the Note 4 Exynos, it achieved a lower battery life score in the GFXBench T-Rex battery test. The screen power is definitely linked here as the Note 4 should achieve better efficiency due to the non-white content of the benchmark. What I think is the real cause though is that the throttling is different from Samsung's own device, even though both run Exynos SoCs whose thermal drivers should be similar if not identical. What we see here, is that the MX4 Pro degrades gracefully to the 420 MHz GPU state and stays there for the remainder of the benchmark run. Huawei's and Samsung Electronic's own thermal policies are much more wobbly and aggressive, making for somewhat of a sinusoidal frame rate graph. The device did get a bit hot, which was noticeable through the device's metal frame, but it was still within acceptable norms. I mentioned how the different runtime modes affected power consumption on the device in PCMark, and I'd like to take time to point out a noticeable degradation I saw in GFXBench. This time I'm presenting the full device power figures instead of just system load power, meaning that this time we're seeing power consumption with the display and power from the operation of the big cores when applicable depending on runtime-mode. We see a large delta when going from the balance mode to the performance mode in Manhattan. This is extremely curious and I wasn't sure what to make of this result but I could reproduce it repeatedly and accurately. It seems we're again dealing with efficiency issues related to Global Task Scheduling that result in non-optimal process placement on the big cores, resulting in a large power penalty. Meizu's runtime configurations all run the GPU at its maximum frequency, meaning there is no artificial performance limitation put in place on the GPU. To inspect this mode, we look at the total perf/W figures when taking into account the FPS results of the GFXBench benchmarks. This time I again subtracted the screen power for comparison's sake with previous data on the Note 4 and as a reference for future reviews. Screen and idle power remained around 896mW at 200cd/m², no matter the type of content displayed. Indeed, the performance/W goes down in both T-Rex and Manhattan when switching from Balance to Performance. Given that the actual performance gain is extremely mediocre, only 0.5fps in T-Rex and 0.9fps in Manhattan, this means that there is no real-world scenario where you would want to use the Performance mode when gaming. 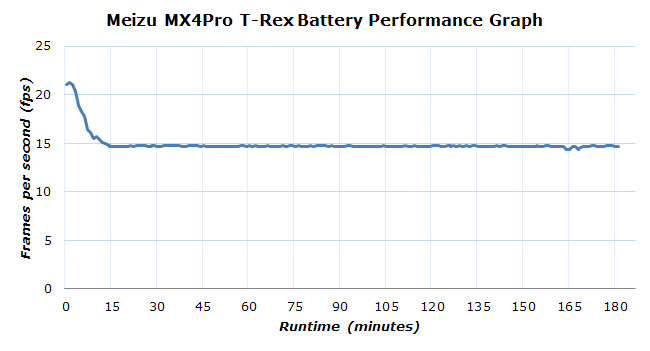 The battery savings mode looks to give an even larger perf/W boost in the T-Rex test as we shave off 400mW for just 1.1fps in performance. Unlike general use, it's definitely worth trying out games in the battery savings mode as it can increase battery life noticeably on the Meizu MX4 Pro without any large performance impact. The Meizu comes bundled with a branded charger capable of 5V 2A output and a 95cm USB cable. The device doesn't come with any fast-charging capabilities. 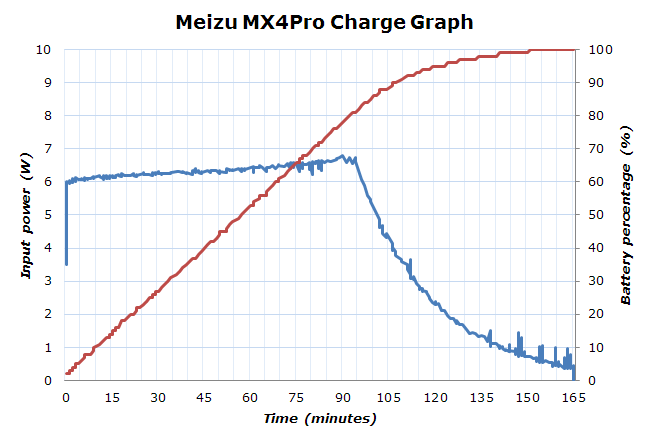 The 10W charger manages to charge from 1% to 100% in about 2.5 hours, putting it on the middle-ground compared to other currently released flagship devices. We see in the charge-graph that the battery uses only 6 to 6.8W of input power for its fast-charging cycle before it switches to trickle-charging. The device achieves 50% in an hour of charging, still giving a good amount of usage per charge time if you are in a hurry. Well, you can't really know. What if they installed it from the hardware to software? They can spy on me. While you at it, also check Apple and Google. They've known to be sharing personal info with the NSA. Its not made up. Do some homework. All the info you need to draw your own conclusion is on the internet.